I don’t usually put posts on my blog that merely link to other web sites, but today I’m making an exception. 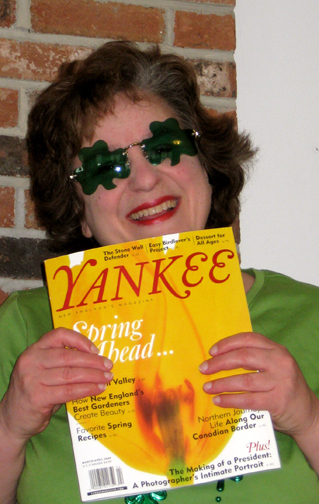 The new issue of Yankee magazine is now OUT—and it features an article on me, Tinky Weisblat. 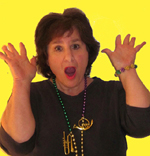 I’m the star of the March/April “Best Cook in Town” feature by veteran Yankee writer Edie Clark. 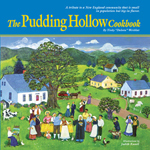 Edie called last fall just before the semi-final rounds of my annual Pudding Hollow Pudding Contest. She needed to interview someone THAT WEEK and hoped it could be I, preparing an original pudding recipe. I was a little taken aback since I had to test seven other puddings for the semi-finals, but I love being famous. So of course I said yes and scrambled together a recipe for something called Cozy Apple Pudding. We had a lovely visit despite the chaos. One of Edie’s greatest assets as a reporter is that she seems like an old friend the minute she walks in the door. She worked and chatted with my mother and me as we cooked and even sat through a rehearsal of my signature song for the Pudding Contest, “Find Me a Man I Can Cook For” by my neighbor Alice Parker. Of course, Alice joined us for pudding. I encourage you to run right out and buy an issue of Yankee. In it you’ll find Edie’s interview with me; my apple pudding recipe (made with apples plucked from the tree in my front yard! 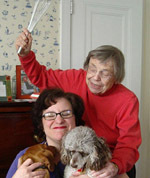 ); and the recipe for one of my favorite entries in the Pudding Contest, Greek Eggplant Pudding by Nancy Argeris. If you must read the article right away, you may look at it online, but I think I look a little thinner in the print version so naturally I want to steer you toward it! Besides, it’s a great magazine with terrific taste in cooks…….